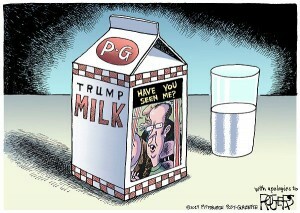 Award-winning editorial cartoonist for The Pittsburgh Post-Gazette, Rob Rogers, had a full week’s worth of cartoons killed by his superiors, an unprecedented editorial move that prompted public backlash in support of the cartoonist. Rogers has subsequently decided to take a vacation while differences between himself and his supervising editor are settled. According to The Washington Post, Rogers had nine different cartoon ideas and ten finished cartoons rejected by The Post Gazette since March. This is highly unusual for a full time editorial cartoonist. Rogers has been with The PPG for 25 years, and worked under the tenure of four different supervising editors, during which time he estimates having two to three cartoons rejected each year on average. But what in todays current events doesn’t reflect the larger partisan divide this country is experiencing? As evidenced by the cartoons axed by the Pittsburgh paper, when you can’t even make fun of a TV star’s rascist twitter rant, without it seeming critical of the highest office in the land, certainly nothing is safe from partisan lines. But editorial cartoons are not news, they are opinion by nature. Some skew left, some right, and some find fault and humor on both sides of the aisle. But the humor comes from skewering those in power, utilizing hyperbole to make the giant workings of the world a little funnier. A fair and balanced editorial cartoon, is just an illustration, something akin to a courtroom sketch.